My running motivation lately has been zilch, zero, nada. So, I started to search for local running events to try to force myself to get in a good run. I found the Herndon Festival 10K and it was perfect. I wanted to get in more than 6.2 miles, but figured I could just add on an extra couple on my own after the race, and even if I didn't feel like it, at least I'd have done 6.2. So I signed up. The weekend didn't start out so great. 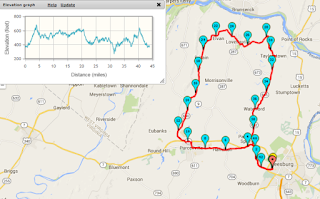 I had an 80 mile bike ride on my schedule for Saturday. Originally I had planned on doing the Team Z ride, but they canceled the Saturday ride, and I already had plans on Sunday, so once again I was on my own. Luckily, Deb agreed to keep me company and we met out in Leesburg at 7:30am, hoping to beat the heat. It was going to be a scorcher. 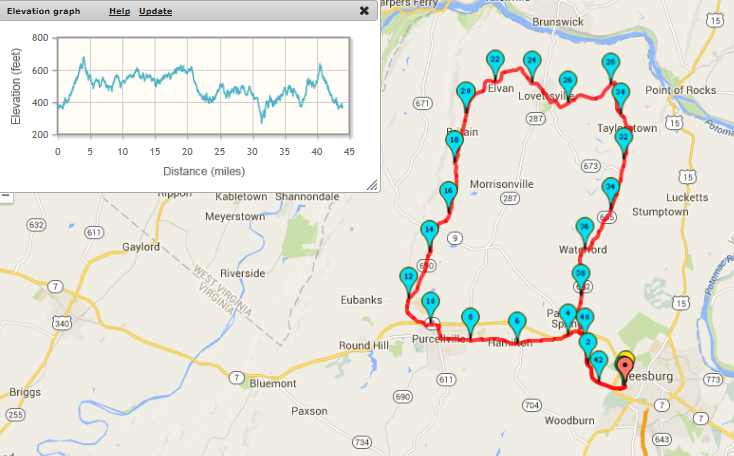 The plan was to do 2 loops of 43 miles each. I knew that the route would start off mostly uphill but then the last few miles would be all downhill. Sure enough, that first five miles were hard, but manageable. Then we found ourselves on a busy road with signs announcing a parade and road closure at 11am. Hmm... Then we continued on and came upon a small road that was closed for a half marathon. The nice officer at the end of the road told us it was fine to bike down the other side of the road, so we continued on, having to jump off the road into the woods to allow vehicular traffic to go through (interesting considering the road was closed!). We had a pretty good little stretch, albeit on terrible rough road conditions, and then turned onto Loyalty Rd. I hate hate hate Loyalty Rd. That ten mile stretch was some of the hardest cycling I have ever done, and I was not prepared for it. It was so demoralizing for me. I guess the positive - if you really want to see a positive - is that I did not have to stop and take any breaks (or walk) at all on those hills (and trust me, I wanted to!). When we finished the first loop, we both agreed we did not want to do that same route again, especially with the road closures (and my flat out refusal to do Loyalty Rd again), so we mapped a new route. Of course, we got lost, but ended up forging our way around, making it up as we went along. It was miserably hot at this point. We found a water fountain and I tried to soak my head, but it didn't help. I puked around mile 55, not sure if it was the heat or the salt tabs I was taking (first time with those) or my mood or what. I knew I was done and we circled back to the cars at just under 65 miles. Terrible. Andrea sent this to me and Paula after my terrible bike, before my run! I am thankful for good friends like Joann, Rob, Paula, Tommy and Andrea who talked to me and helped get my head back on track. Still, given the awful training day on Saturday, I wasn't sure how this 10K was going to go, if I was going to be able to move at all. I pulled myself out of bed, popped a few Advil, chugged some water and nuun, and started driving out to Herndon. It was a small race (maybe 250 people) and immediately I wondered if I was going to be the last person, if I would even make it the whole distance. But as they started us, I started jogging along, slow and steady. I'd decided against intervals, that I would run when I could run, and walk when I needed to. I ran nearly the first mile, took a short walk break and finished that first mile in just over 12 minutes. For me, that's fabulous! The next few miles slowed down, but still in the 13 min/mile time frame, which again is amazing, especially after a long ride the day before. I was leap-frogging some people for awhile but eventually got far enough ahead of them that I couldn't even see them when I turned around. I was thankful there were 3 water stops versus the one they advertised. It was another hot day, even with the 7:30am start! I saw some runners in front of me and wondered if I could catch up. I did. I was consistent the whole way and finished strong with an official time of 1:23:21. Not my fastest, but felt good. This run made me happy, and I was glad to end the weekend on a positive note. Before getting in my car, I decided to do an extra couple miles on the W&OD trail which was right there. A few steps in, I had a sharp pain just under my front hip bone and I think I pulled something (biking or running? who knows.. ice later). So, I basically walked / hobbled the additional couple miles, but I got in the distance for 8 miles total. I will take it. And for a bonus, I got back to my car, checked my phone and had a text from Jon telling me he was proud of me for getting in my workouts this weekend. I drove home with a stop at Panera and spent the rest of the day at a couple wineries with Jon, Sweeney and Anjelika. I made it to recovery week!! Yippeee!! I've never been a huge fan of yoga, but damn that felt good on Monday. Then Tuesday morning at swim practice, Linda told me that she was a SAG for the team ride on Sunday and many people there had issues with the heat also, so it wasn't just me. Feeling a little better... and looking forward to my massage this evening!